Several of our readers have suggested that this beverage is somehow "Disco Lemonade." Other than the line in the Marcy Playground song, I didn't think Disco Lemonade was a thing. Apparently, I am wrong yet again. There are two ways to make a Disco Lemonade cocktail, and though neither one involves this Trader Joe's beverage, I'm sure a little blue curacao and/or vodka mixed into this product would produce a tasty concoction—and an interesting version of the drink. But we didn't get a chance to find out with this bottle. This is a highly chuggable, smooth, sweet, sassy lemonade right here. It's been around for quite a while in that TJ's beverage section. Not sure why we never checked it out until now. It has just the right amount of mangoiness. It's very sweet, but there's a hint of tanginess, too. 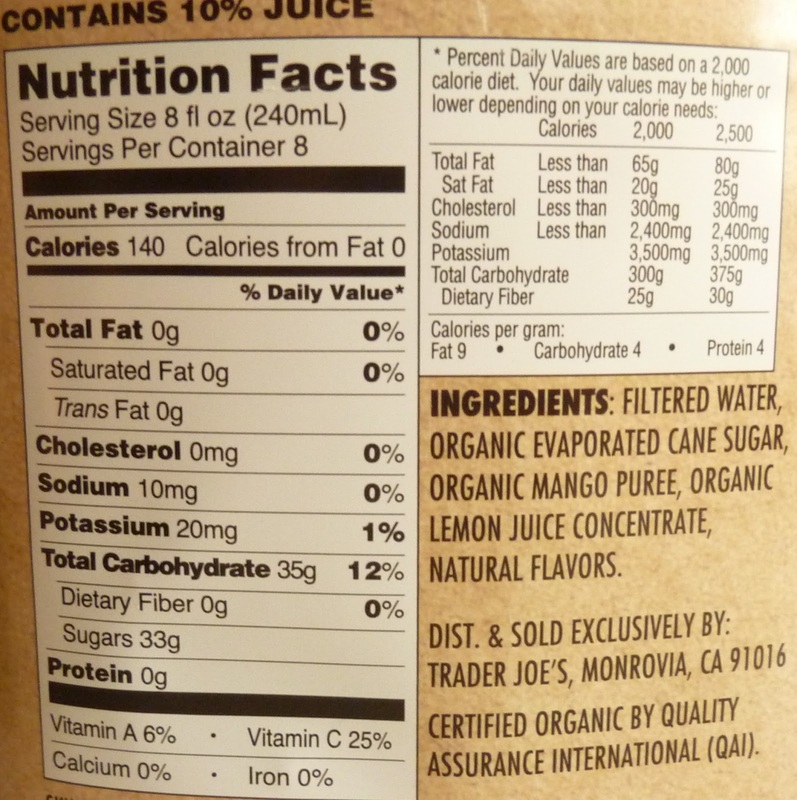 Mango has a great flavor, but it can sometimes be overpowering and unpleasant. See Mango Nectar. Mango Green Tea was similarly disappointing to Sandy and Russ. More successful were the Apocalypse Now Juice and the Orange Peach Mango mix. This beverage is thin like lemonade, and it's über-refreshing on a hot day. The flavor's a bit more interesting than plain old lemonade, but it has a similar calorie count and sugar content. I really can't think of a single complaint I have about this product. The price is reasonable at $3.49, considering it's "organic." I put quotes around "organic" to satisfy those grumpy people who want TJ's to spend millions of dollars to hire a third party to investigate all of their organic claims, effectively raising the price of every organic product in the store. I'm happy just to take their word for it and shell out less money, though I might pay for that cavalier attitude some decades hence. On that cheerful note, we leave you with our final thoughts: this is some really good stuff. 4.5 stars from me. 4 stars from Sonia. Have to try that, KBF! Greeeat now all I can smell is s*x and candy. Throwback Thursday for real!